South Africa is one of my top five favorite countries — but it’s easily my #1 favorite wine country in the world. The wines here are extraordinary, shockingly affordable, and they have tastes that I don’t experience in any other country. I don’t know what it is about South African wines. I’m more of a red wine fan in general, and love me some Pinotage, but South Africa’s whites are magical — they have warm, vanilla-y notes that enthrall me. No other whites are like that. If you want to go wine tasting in South Africa, many people spend a day in Constantia or one of the suburbs immediately outside Cape Town. But if you want to do South African wine country right, spend a few days in Stellenbosch. Stellenbosch is a university town about an hour outside Cape Town. It’s one of the oldest towns in South Africa and it’s populated primarily by Afrikaners (Afrikaans-speaking people of Dutch descent). And it is world renowned for its wines! 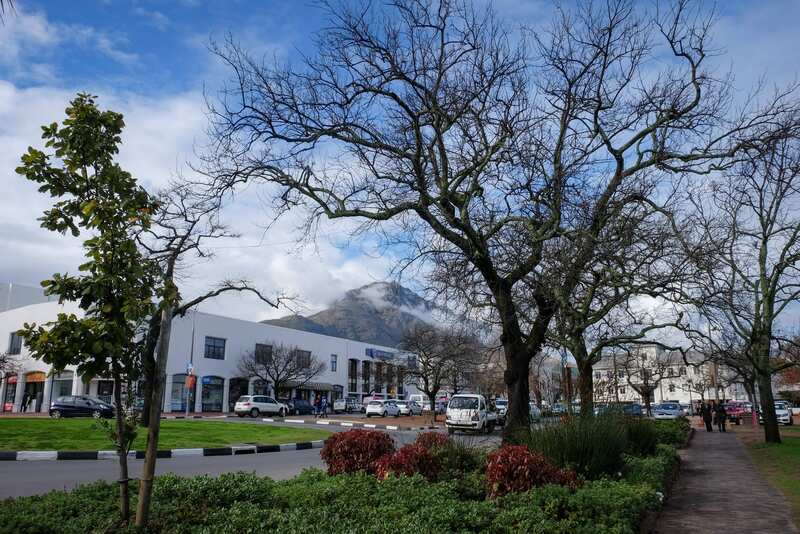 Stellenbosch has a population of roughly 100,000, which makes it a great size for wandering. The downtown area is home to several top-notch hotels, restaurants, cafes, and shops. And because of the university, it has a laid-back, youthful atmosphere. Because South Africa is an exhausting destination and you’ll need a break. Don’t get me wrong — I adore this country fiercely and whole-heartedly. But South Africa takes a lot out of you. You need to be much more cautious about safety, and not only in the cities (see my South Africa safety guide here). Going on safari is awesome, but game drives require pre-dawn wakeup calls and you may be out in the harsh sun or freezing cold for hours, often both on the same day. And if you’re diving into culture, much of South Africa’s recent history is painful and heavy, especially if you visit lots of Apartheid-centric sights. In short, give yourself downtime. One of the biggest mistakes I see travelers make is not leaving any time for downtime. Travel is exhausting under normal circumstances, and trying to see literally everything is a good way to run yourself ragged. 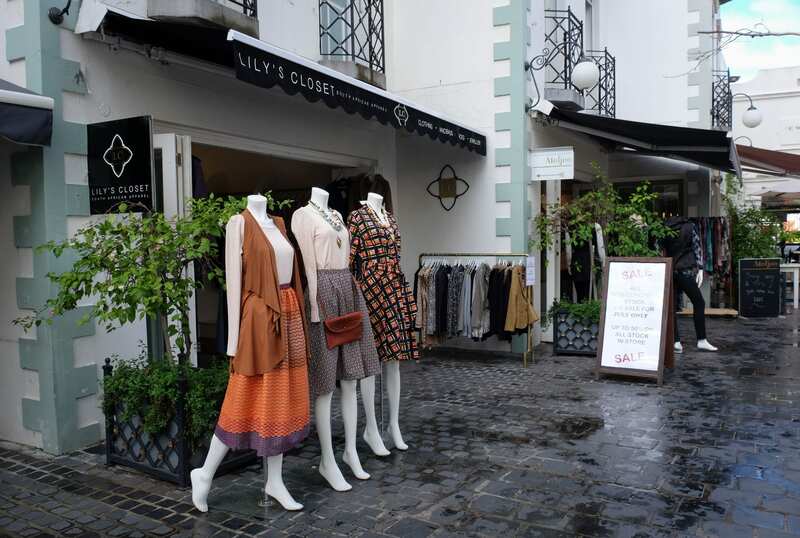 So plan some low-key days into your itinerary no matter where you go, whether it’s a day chilling out at a beach club in Sicily or a day cafe-hopping and photo-taking in Paris. For our two-week trip, my friend Beth and I started with a few days in Johannesburg. Next was a few days on safari in Kruger National Park. We then hit up Cape Town for a few days. Stellenbosch would be the final destination. And that itinerary was perfect. By the time we arrived in Stellenbosch, we were ready to veg out and relax. We lucked out on our first day — my friend Charmain, who is married to my college friend Mark, offered to drive us from Cape Town to Stellenbosch, visiting three of her favorite wineries. Charmain is from Pretoria but she’s lived in Cape Town for a long time and I found that many locals agreed that she took us to the best places! Fairview Wine and Cheese — Come here for the cheese. When you arrive at Fairview Wine and Cheese, you’ll see a few goats hanging out by the entrance. Yes, they make their own goat cheese here! And lots of other kinds of cheeses. The three of us sampled several wines and cheeses. And while the wines were good, the cheeses were exemplary. We bought a few to take home as well. If you are a cheese fan in the least, you need to come here! Spice Route — Come here for the food. 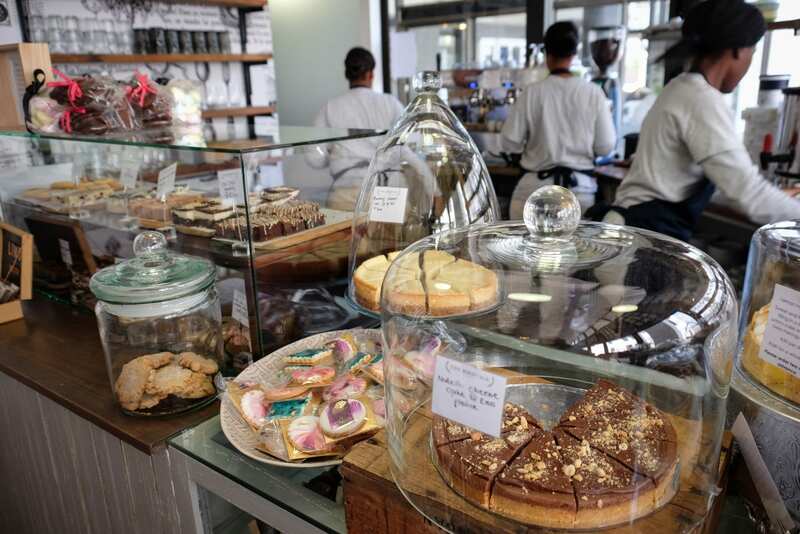 Spice Route is a collection of eateries and restaurants near Paarl, just outside Stellenbosch. Theres a section for cured meats, there’s a deli, there’s a pizza place, and there’s even a brewery called Barley and Bilton that serves beer and biltong (South African jerky). And of course, they have wine tasting as well! We tasted four wines with some cured meats. You know I enjoyed that pairing! After, Charmain took us for some South African-style pancakes, rolled thin like crepes. Waterford — Come here for the chocolate. Waterford is the winery I heard recommended most often from locals in Stellenbosch. It’s got a luxurious atmosphere and feels like a grand manor belonging to some member of royalty. Their wines aren’t half bad, either. At Waterford we took part in their chocolate tasting! We each received three wines to pair with three little squares of chocolate. It was a stormy day and it felt amazing to curl up by the fireplace. For our second day, Beth and I decided to try the Vinehopper — a hop-on, hop-off van visiting several wineries. They take several routes depending on the day, so you can take three different routes three days in a row if you’d like. I found this to be the best way for people without a car (or people who all want to drink) to sample lots of places in Stellenbosch. What you lose in spontaneity you gain in convenience. Neethlingshof had a modern atmosphere with a fancy dining room for sampling. We tried several reds and whites and I bought a bottle of The Owl Post to take home. 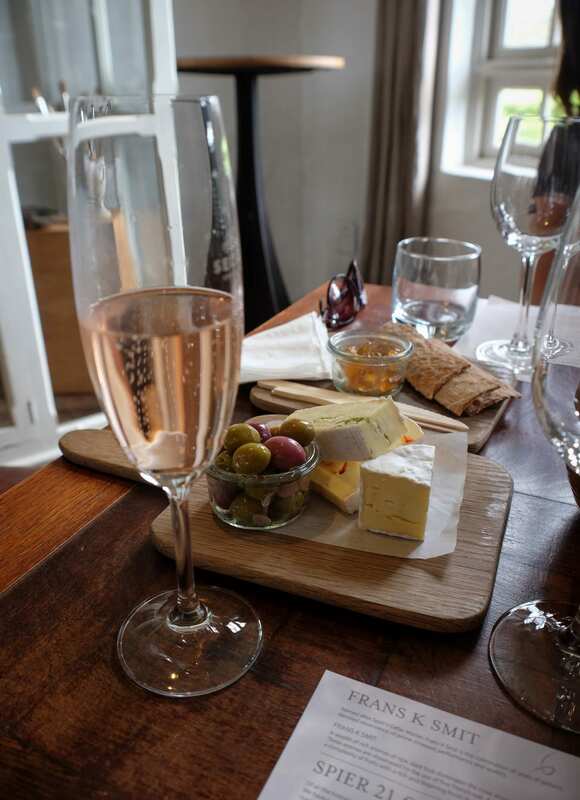 Spier was next, and while we didn’t do a full tasting, we sampled their sparkling rosé and a cheese plate. I also bought a bottle of their chenin blanc to take home (and it’s the only bottle I have left after nine months!). Spier has beautiful grounds as well, so it’s a good spot to take some outdoor photos. Like Waterford, Bilton Wines is famous for their wine and chocolate tasting! But the pieces we got here were much larger than the ones at Waterford. Each one was roughly the size of a Kit-Kat strip. They also have award-winning merlot that pairs well with the cardamom chocolate. Well, let’s be honest — by the time you hit the fourth winery in a day, your memories start getting fuzzy. 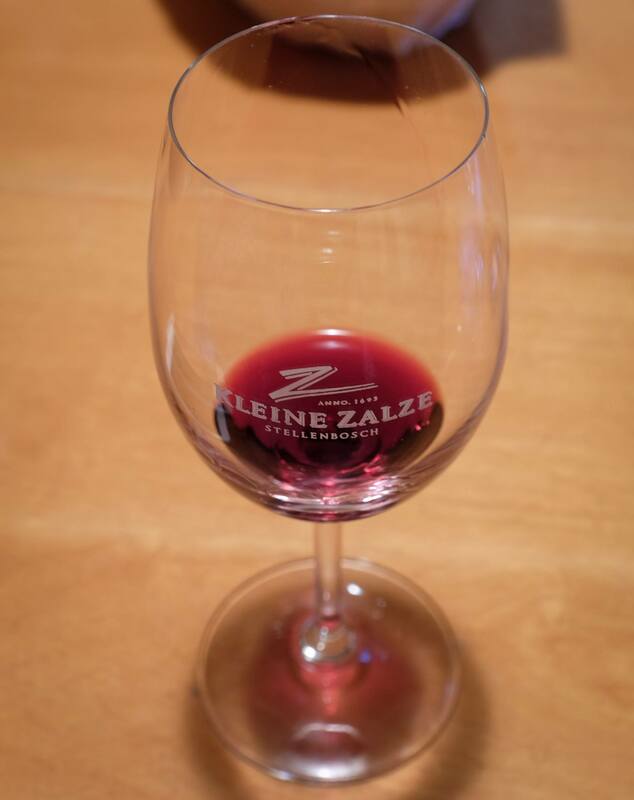 I did enjoy Kleine Zalze, though, and I bought one of their bottles of red to take home. Vinehopper has three different routes. A one-day pass costs 300 rand ($22) and a two-day pass costs 540 rand ($40). Wine tastings are not included in the price, but they generally cost 15-45 rand ($1-3) for around six tastes at each winery. Note that the wineries close at 5:00 PM, so you’re best off getting an early start. Franschoek is like a mini version of Stellenbosch with a French flair, about 45 minutes away by car. It’s a much smaller town filled with galleries, jewelry shops, and cafes. We started with some wine by the fireplace at a restaurant called Dutch East. I’m pretty sure we were the youngest people there by 30 years. 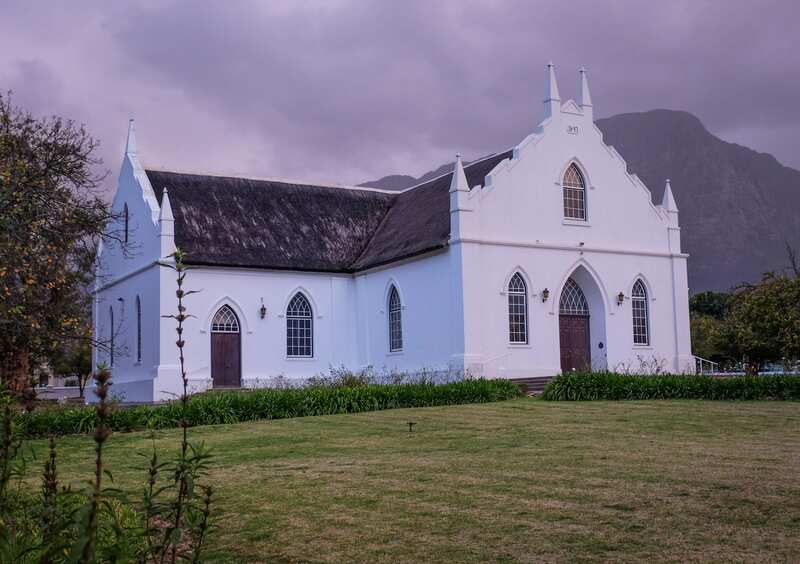 When we were planning our trip, Beth and I discussed whether to stay in Franschoek or Stellenbosch. Overall, we were happy with our decision to stay in Stellenbosch. 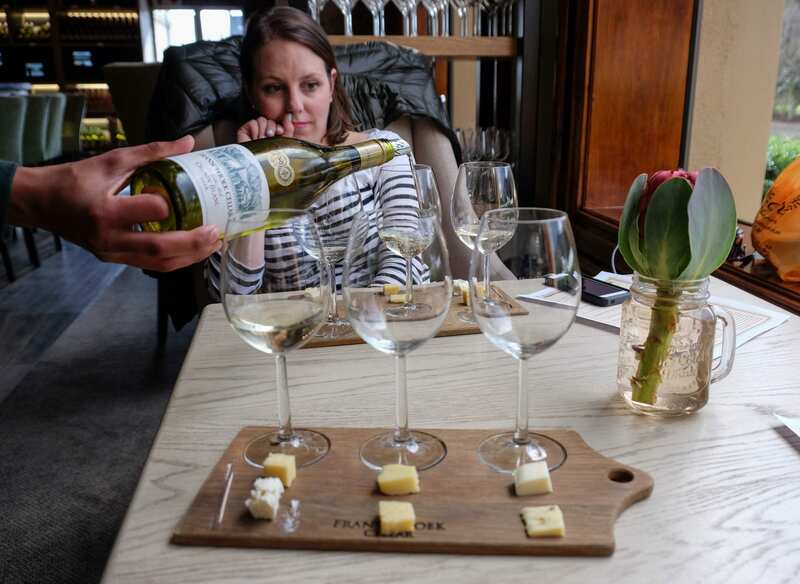 We would have been bored out of our minds after two days in Franschoek. If we had stayed longer, I’m sure we would have done their wine tram. We took an Uber from Stellenbosch to Franschoek but couldn’t summon any in the area on the way back, so we had a restaurant call us a cab. The Uber cost us 258 rand ($19) and took 45 minutes; our cab on the way back cost 300 rand ($22). Our flight departed Cape Town late in the afternoon, so we were determined to get a few more tastings in before we left. Beth found a driver who would take us to a few wineries and then to the airport from there. It was the perfect way to enjoy our final day in Stellenbosch. Fleur du Cap — Come here for their salt tasting. As soon as I heard that there was a wine tasting paired with salts, I knew I had to try it! Fleur du Cap offers a tasting where they give you five wines, five salts, and several little dishes for experimenting with the salts. One was a stuffed grape leaf; another was olive paste. It was so much fun! This tasting is why I now use pink Himalayan sea salt all the time in my cooking. (It sounds more expensive than it is — you can get it for like $4 at Trader Joe’s.) Beth and I were also both horrified by Indian black salt, which smells like rotten eggs. Apparently vegans like it because it’s an animal-free way to get the taste of eggs. But isn’t the taste of eggs the worst part about them? It’s all about the texture, baby! Salt tastings take place at 12:00 PM only and you must book in advance. Cavalli Wine and Stud Farm — Come here for the photo ops. Cavalli Wine and Stud Farm was easily the most scenic winery we visited. The grounds were so beautiful and the building itself was a modern masterpiece. All of their wines are named after horses. We sampled a few wines and a cheese plate and they actually gave us a free bottle of wine to take home because they were busy and took so long. And with that, we were off to Cape Town to catch our flight to Johannesburg, then to Amsterdam, then home to New York. But which wineries were the very best? If you’re limited on time, I would prioritize visiting the very best of Stellenbosch. 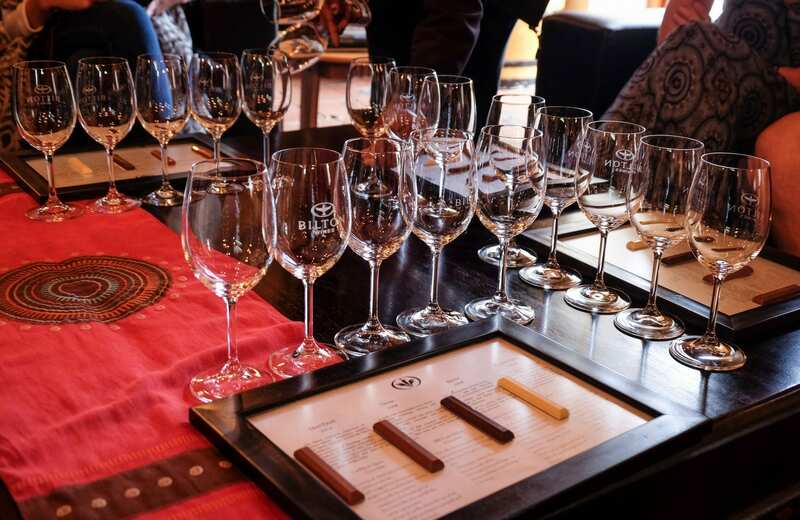 That would be cheese tasting at Fairview, chocolate tasting at Waterford, and salt tasting at Fleur du Cap. 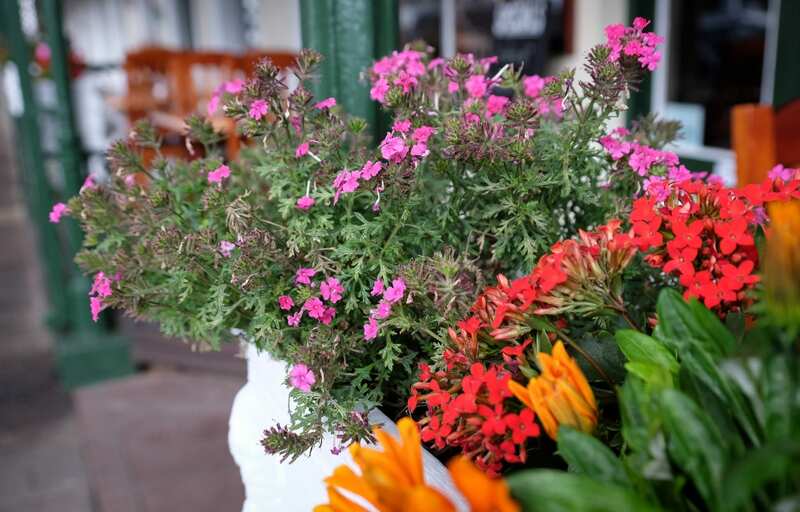 If you’re looking for budget accommodation in Stellenbosch, Ikhaya Stellenbosch Backpackers has dorms, private rooms, and apartment-style suites for a low price and a great location right by the center of town. If you want a mid-range hotel, Stellenbosch Hotel has the feel of a B&B with the amenities of a hotel, right in the center of town. If you want something high-end but not too expensive, check out Coopmanhuijs Boutique Hotel, a stylish Stellenbosch boutique hotel with a pool in the center of town. And if you want to blow your budget, you probably don’t care about being in town because you can afford to hire a driver for your whole trip. If that’s the case, go for Delaire Graff Lodge — it’s pretty much the most luxurious property in the Stellenbosch area. You can find more Stellenbosch hotels here. The Big Easy is an excellent yet affordable high-end dinner spot. I loved my venison, but the standout was Beth’s parmesan and mushroom risotto. Melissa’s the Food Shop is an adorable cafe and grocery store. It’s only open for breakfast and lunch, and they have adorable pastries. This is also a good place to stock up on food souvenirs. The Bird Cage is a quirky café that does lovely breakfast dishes. Their main business is wedding cakes. This is one restaurant that will look great on Instagram, FYI. And don’t underestimate having a meal of wine and cheese back at your place! The conundrum about wine regions around the world is that they are best to explore by car — yet driving is the last thing you should be doing while wine tasting. You may want to rent a car and have one person stay sober. But if you both want to drink, look into hiring transportation! You can summon Ubers within the town of Stellenbosch, but summoning them at outside wineries and in Franschoek is difficult to impossible. In that case, ask the winery to call you a cab. I loved the day we spent on the Vine Hopper and it was a great way to experience lots of wineries without worrying about transportation. And hiring a driver from a tour company was the most logistically easy way to visit a few wineries, leave our bags with him, and go directly to the airport from there. 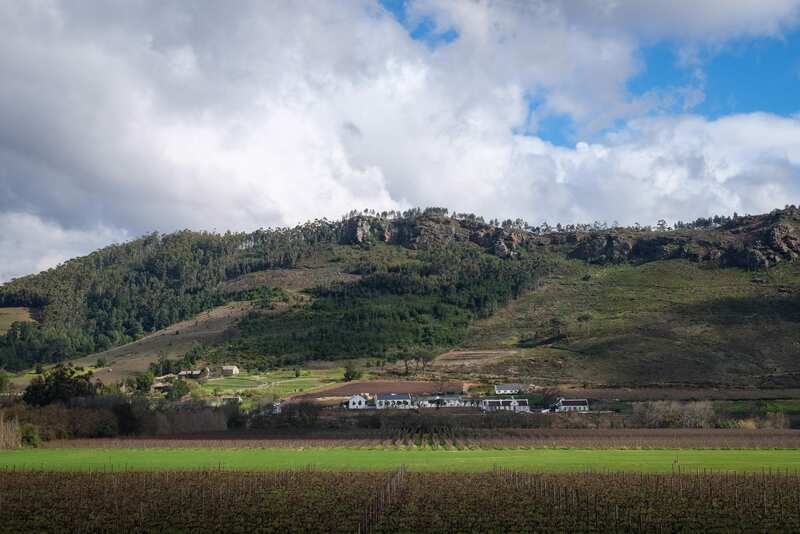 Stellenbosch is a great year-round destination. Beth and I visited in the winter (July) and while I was a bit nervous, as winter weather is roughest on the Western Cape, winter ended up being a great time to visit. The main reason? Fireplaces. It seemed like nearly every winery had a fireplace or two, and it was so nice to bundle up near a roaring fire with a glass of Chenin Blanc in your hand! Secondly, hardly anyone was visiting then. We were often the only two people visiting a winery. And because of that, hotel prices were lower, too. Weather-wise, some days were sunny, some were rainy, and some were a mix, but a light leather or denim jacket with a scarf was all we needed. Pack an umbrella because the weather can change quickly. You can’t go wrong any time of year, though. Fall is a popular time to visit, as that’s when the new bottles will be coming out, and summer is high season. Do be prepared for higher prices and bigger crowds in those seasons. One thing I noticed was that nearly every single tourist I saw in Stellenbosch was white. The only black people I saw were working. I noticed this often throughout South Africa, but it was more significant in Stellenbosch than anywhere else. Racism in the wine tourism industry is not unheard of — a few years ago, a group of black women were kicked off a wine train in Napa Valley for apparently laughing and talking too loudly (aka #LaughingWhileBlack); they were met by police when they arrived at the station. The company claimed it was “acute insensitivity” and not racial bias at play; the women sued the company and reached a private settlement. I’m not knowledgeable enough about race relations in South Africa to speak at length, but I will say this: Most non-South Africans assume that things immediately got better when Apartheid ended. That’s not true. Laws may have changed, but new injustices sprang up to replace the old laws. It’s similar to the United States — a lot of people assume things got better once the Civil Rights Movement happened, but the injustice only changed form. Now it’s in the form of criminal injustice and police brutality, among many other things. What I do recommend is having conversations with South Africans about their lives. Talk to black people, white people, colored people (colored means mixed race and is a non-derogatory term in South Africa), Asian people. Don’t insist that everyone tell you about Apartheid, because it’s nobody’s job to educate you on their painful time in history, but you’d be surprised at how often South Africans bring up Apartheid on their own. Either way, I guarantee your eyes will be opened once you hear their life stories. After seeing how white the wine tourism industry is in Stellenbosch, I wish I had made an effort to visit black-owned wineries. You should do the same. 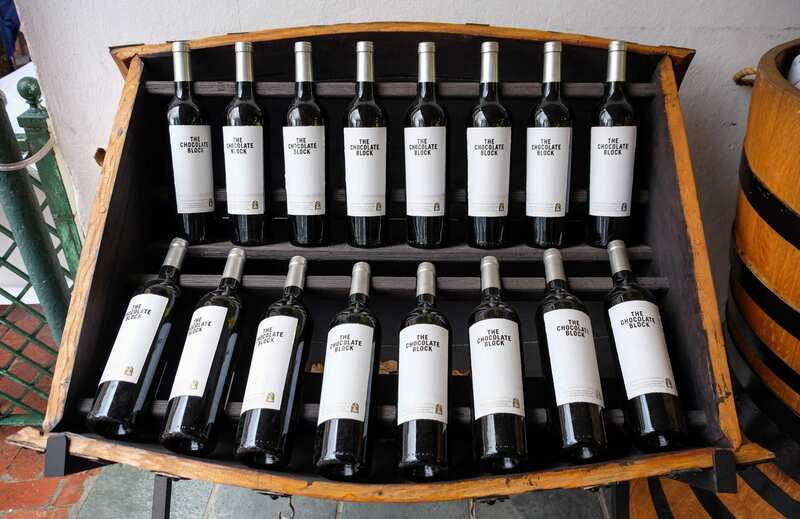 Here’s a list of black-owned wineries in South Africa; here’s a Guardian feature on black-owned wineries in South Africa. Stellenbosch was one of the highlights of our trip. Both Beth and I loved our time there and our three and a half days of drinking wine and eating cheese was the perfect way to wind down after ten busy days in South Africa. Would I return? You absolutely bet I would! I only scraped the surface when it comes to wineries! I brought six bottles of my favorite wines home. I didn’t pay more than $11 for any of them. Essential Info: To get into Stellenbosch, you can take a cab, bus, or train from Cape Town. There are also several private shuttle services. If we hadn’t had Charmain to drive us, we would have taken a private shuttle. Locals I spoke to recommended avoiding the train. You can find hotels in Stellenbosch here. I recently read Trevor Noah’s book Born a Crime, which is about his childhood during and after Apartheid in South Africa. It’s an outstanding, gripping, fascinating book and I urge you to read it before you visit South Africa. I actually recommend getting the audio version because Trevor does tons of different accents, languages, and voices. South African power adapters are hard to find outside South Africa — get one before your trip. Don’t visit South Africa without travel insurance. Whether you get appendicitis while on safari and need to be hospitalized, or your phone gets stolen in Cape Town, or an injury means you need to cancel all or part of your trip, travel insurance will help you out. I use and recommend World Nomads as travel insurance for trips to South Africa. Have you been to Stellenbosch or gone wine tasting in South Africa? Share away!